In situ installation – Esplanade of the Acte Memorial. The installation evokes the wait-and-see attitude towards a water level that will not stop rising… Global warming, desertification, rising sea levels, coastal erosion and melting glaciers are already throwing millions of men, women and children out of their homes, sometimes from their island, and condemning them to emigrate. We are all potentially CLIMATE REFUGEES. In response to the annual climate conferences, I highlight this artistic project, which calls on cultural and educational actors and civil society to mobilize and explore a new approach to ecological themes. My artistic and militant approach, far from discourse and numbers, is only intended to raise awareness and reveal the importance of the threat that climate change represents for our island territories. The installation # ALL CLIMATE REFUGEES is part of a participatory process that involves and engages the public from the beginning to the end of the creation. From the collection of used jeans to the installation is set up in situ with the kind assistance of the city’s art students. To close the exhibition, the public is invited to a participative performance at the heart of the installation. Performance # Tous Réfugiés Climatiques from Guy GABON on Vimeo. In 2018, Meeting of « Yué » and « # All climate refugees » which became « Yué # sorority ». There is an awareness among women artists that this world is no longer viable. Beyond their commitment, they feel a call that connects them from heart to heart, converging insights and common needs. An alarm has lit in their consciousness and it flashes, pushing them to act, to commit, to reflect, to make them a community to feel more powerful. « Yué # sorority » is the meeting of three female artists, Myriam Soulanges, Anne Meyer and Guy Gabon, and their original works, which invites women to come together and build a new way of living in the world. It integrates new bodies, new trajectories: a regeneration by sorority. 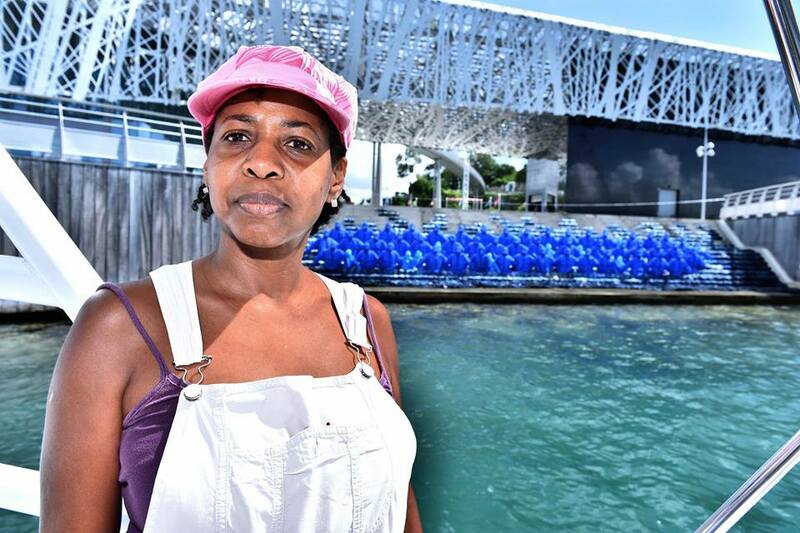 « Yué # sororité » began in May 2018 at Le Moule in Guadeloupe; since then, « Yué # sororité » moved away, exported itself and proliferated in French Guiana (October 2018), in Miami, in Les hauts de France, and in Paris.